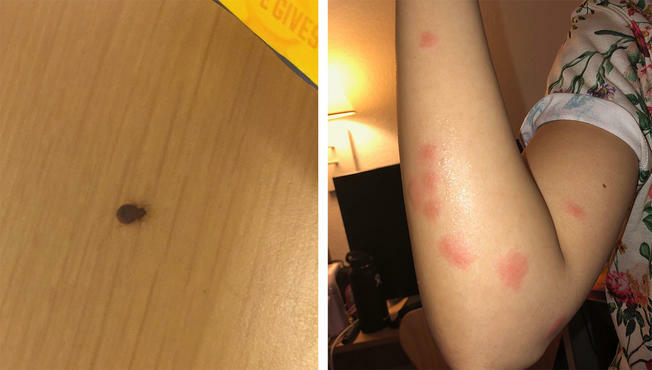 When Lillian Almario checked into a Palm Springs Motel 6 for Coachella Music and Arts Festival weekend, she didn’t expect to check out with bed bugs. But that’s exactly what she says happened. “The very first night we woke up with bites,” Almario told NBC4. She and three girlfriends discovered beds bugs in their room, including one on a night stand next to a bed. Almario provided pictures of the bugs and the bites to the NBC4 I-Team, which has been exposing problems with sanitation at Southern California hotels. “It was painful. We were scratching a lot,” Almario said. They asked for a different room, but it was Coachella weekend and the hotel was full so they couldn’t change rooms. Almario says she and a friend who was bitten badly slept in the car. “Bed bugs are becoming epidemic in hotel rooms throughout the United States,” according to BedBugs.com, a website that tracks bed bug sightings. Motel 6 did refund Almario and her friends $790 for their full three-night stay. Bed bugs aren’t the only problem NBC4 has found at popular hotels. Watch the story below to see how the I-Team discovered that some hotels don’t change sheets, towels, even cups in between guests.